After a very entertaining weekend in which I was the host of a Halloween party, I decided to spend the actual night of Halloween in good company to enjoy a double-feature-stay-at-home-movie-date. My evening started with 2007’s “Trick ‘r Treat” followed by 2003’s “High Tension”. Thankfully, both proved to be somewhat entertaining in their own ways making for a rather enjoyable end to the festivities. Directed by Michael Dougherty and starring Anna Paquin, the wonderful Brian Cox and Dylan Baker, “Trick ‘r Treat” follows interwoven story lines that take place on Halloween night in some nameless town in America. At first, I assumed I was watching your typical serial-killer type of movie where our murderer hides in the fully costumed crowds to perpetrate crimes without being noticed. Luckily, I was a bit off. From the beginning, there is a certain element of the supernatural that lurks in the shadows just enough not to become so obvious. The stories do rely a bit on the typical mistakes victims tend to make that ends up getting them killed, which I call “Low IQ horror Flick Syndrome”. Despite the obvious cliches, the film does pull through, especially when we are introduced to the terror-seeking group of kids that head to a quiet part of town to find out if the myths about a school bus massacre are true. As it happens often in Hollywood, talented child actors give a movie a sense of wonderment, innocence and tenderness that is otherwise unattainable with adult actors. Another successful bit of “Trick ‘r Treat” is that it finds a way to explore, with mixed success, several genres of cinema. Despite being labeled as a “horror film”, the movie does manage to come across a bit like a comic story to scare naughty children before Christmas time. The film is odd enough to also introduce highly sexual moments that seem in direct contradiction with the more innocent aspects of the story. As for scares, there aren’t that many. This is rooted in the lack of suspense and the complexity of a script that tries to connect stories that feed off each other in a non-linear fashion. 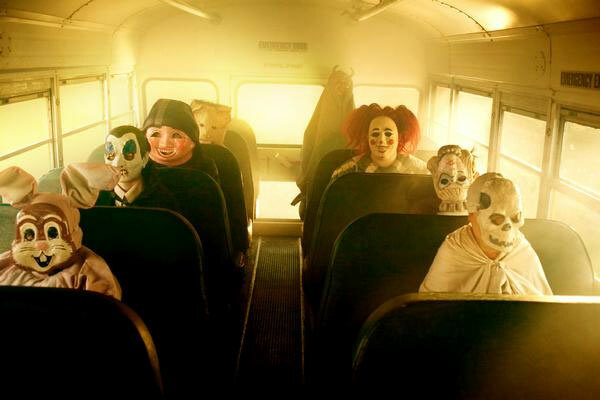 The most effective scene that captures all of the best aspects of the film, especially in terms of comedy, come in the form of a bitter old school bus driver and a living Jack-o-Lantern that have an epic battle inside a run-down suburban house. Otherwise known as “Haute Tension” in its original French version, the film was directed by Alexandre Aja, who has had the chance to expand its work to Hollywood with the intense “The Hills Have Eyes” of 2006 and the less successful “Mirrors” starring Kiefer Sutherland. It comes as no surprise to me to find that this French director was able to make the leap to Hollywood because “High Tension” feels like an American blood bath that happens to take place in Europe with the help of a couple of attractive French women as lead actors. Where the film succeeds is in the manner in which it maintains a heightened sense of realism that made me feel helpless as a spectator to the brutal crimes happenning infront of me. The setting might be your typical middle-of-nowhere countryside home where people seem to be asking for intruders, but it has a picturesque simplicity to it that is unusual and fresh. Even though there is no apparent mystery about the killer, the film manages to move slowly yet decisively until almost all of the victims suffer the same unfortunate faith and an unexpected twist is introduced. The roughed look of our presumed killer only enhances the level of gore and crudeness that is at the core of the film. There is a lack of finesse in the manner in which the events unfold and, of course, violence exceeds expectations, managing to be of service to the dreadful aura of the film at first, before it becomes a disservice that only seems to feed the saddistic desires of the film-maker in a way that is less than artistic. It is this particular problem that keeps the film from being a true horror fest, limiting it to not much more than a sometimes scary, but sometimes average film with a great deal of violence. I would still go on a limp and recommend it for fanatics of violent films, especially because this is one that was done with enough care. My local cinema was doing a allnighter on horror films, starting from 23:00 and lasting 7 hours! I almost went but could not handle that.. I loved Haute Tension, it’s pretty much my favourite slasher. That’s not saying much though. I liked the unfinished feel! There is some good to High Tension that was enough to make me give it a 3 out of 5. The film starts out pretty strong and I feel it loses its uniqueness about halfway into it. It is one of the better slasher movies though, but like you said, that is not saying much. Did you ever catch Bram Stoker’s Dracula (1992) ? I forgot to include it on my horror favourites list. Very underrated Francis Ford Coppola film. Great cast, great atmosphere.